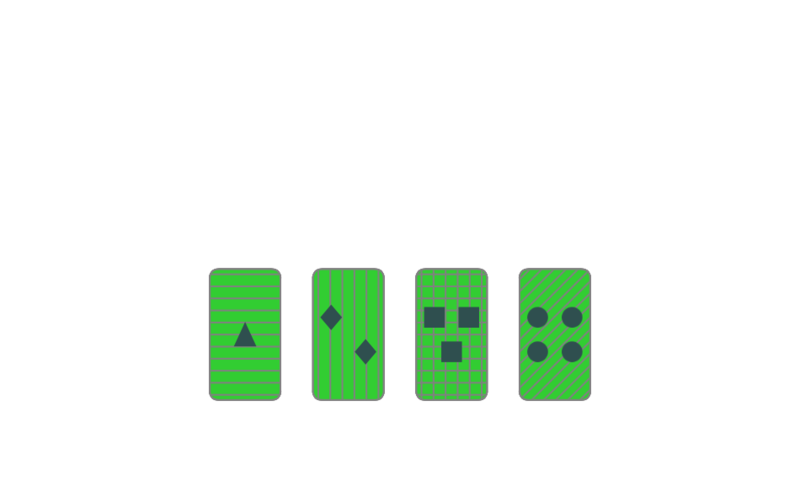 The Card Sorting Test is an adaptation of the Wisconsin Card Sorting Test (R). This test is a very well established neuropsychological diagnostic tool in clinical environment. Subjects must sort cards into different pile according to one of three feature dimensions: background, shap, number of shapes. Only one of the three dimensions is active a given point in time. After a series of trials, the active dimension changes so that over time all dimensions have been used. What makes this test specific is that subjects must infer from feedback what dimension is active and then continue to use this rule set until feedback teels them to switch to a new dimension. Because of this active learning component the test has a strong “executive function” component since subjects have to adjust to a new series by adjusting their rule set based on the feedback they get. Besides the measuring the flexibility of shifting and applying different rule sets, this test also has a strong working memory component since the feedback has to be associated to the rule recently applied and the subject must also remember the currently active rule. E. A. Berg. (1948). A simple objective technique for measuring flexibility in thinking J. Gen. Psychol. 39: 15-22.